In the top quarter of the draw one already meets a totally unexpected clash because whenever Serena Williams loses it's a surprise, but whenever she does it with such an open draw it's ever more. Serena was indeed given as the sure winner after the fall of Sharapova and Azarenka in the second round and ever before that, considering her record on Grass and the great win in Paris, she was the one to defeat for the title. Her executioner was German Sabine Lisicki, whose form seems to hit every year around this time, since she reached the QF last year too by defeating RG's reigning champion Sharapova before falling by the hands of Kerber -who was taken out by her next opponent just few days ago. This year Lisicki took down again the RG champion, but she seems the favourite to win her clash with Estonian Kanepi, because the two play a very similar game, but probably Sabine has more experience on the surface and Kaia is not known for her brave heart when it comes to seizing chances. The only match one could espect when the draw came out, is the only one that seemed more unlikely for both players to reach that far, because the Polish came to Wimbledon without the same positive results of the last year and Li Na had quite a few tricky opponents on her way too. Last year's champion needed all her talent to edge past American big hitter Keys and then to come back from a set down against grass-specialist Pironkova, while Li Na needed a huge focus to defeat in three sets Romanian Halep, who came to the match with two tournaments won in a row and then she edged 8-6 in the 3rd set against Czech Zakopalova. Nonetheless, Li Na found her whole game and security to easily thunder past Italian Roberta Vinci and head to this match with the best hopes to finally go beyond the QF of Wimbledon, something she had never done before. My guess is that if Radwanska passes this test, she's going to win the whole thing, but Li Na won't surrender easily. In the section of the draw where Maria Sharapova was given as the biggest fave to reach this far and Caroline Wozniacki as the second fave, no-one of the two could go further than the second round as the first was shocked by Portugues Larcher de Brito and the second defeated by Petra Cetkovska, but most of all by a nasty ankle injury happened in the very first games of this match. It wasn't much of a surprise the fell of the second highest seed of this section, as Sara Errani (5th seed) was routined by youngster Monica Puig, whose game and power were too much for the Italian clay-courter. In the end Stephens could take advantage of the lack of real contenders left and despite playing quite below her best level, she could go through quite a few potential good matches, mostly because of her mental strenght, opposed to the fear of winning that hit both Cetkovska and Puig, when they were called to close their matches. On the other side of the net there's 2007 finalist Marion Bartoli, whose experience on the surface is surely big, but her form was given dire as she retired from Eastbourn last week and her results this year were quite below her talent. Yet, she's a great fighter and could get this far by defeating en route a few tricky grass specialists like Giorgi and McHale. If the French can play the whole match on a good level for her standards, she can be quite safe for a place in the semifinals, but the young American seems never to fear taking chances, so don't count her off. In the section towered by world number 2 and Australian Open champion Victoria Azarenka, it was Belgian late-comer Kirsten Flipkens to get the chance to reach her first slam Quarter Final of her career. Her story seems the one of a movie, as only last year around this time, she was playing ITFs because injuries and losses were keeping her away from the best 200 of the world. "Flipper" with her deadly slice and fighting attitude won her place in the QF by facing no seeds en route, thanks to the walkover of the world n°2 given to Italian Flavia Pennetta, who later defeated Alize Cornet to reach her 3rd Wimbledon 4th round. The Italian wasn't the favourite in her clash with Flipkens, mostly because they had faced in RG round 1, when the Italian was defeated after a very long battle. On grass things didn't change much, with the Italian being the best player on court until she served twice for the first set. From that moment on Pennetta looked tense and couldn't express her best game, while the Belgian started to believe in herself more and the match went all the way on her favor. 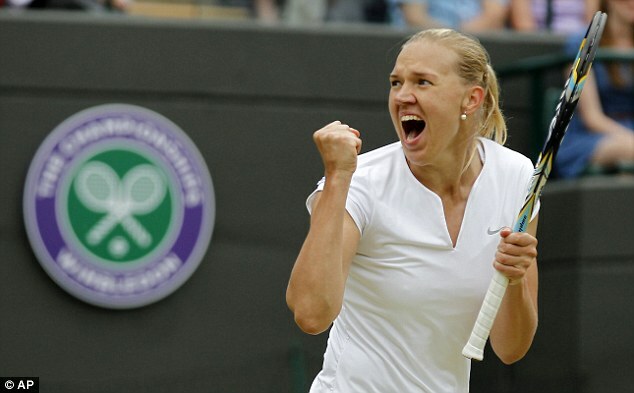 Her opponent will be the former champion Petra Kvitova, who seems to be far from the form that gave her the title few years ago, she struggled to win her first round against Vandeweghe and then she was saved by a rain break against Ekaterina Makarova. Yet, her game seemed to click against Suarez Navarro in the 4th round and she probably is the fave against Flipkens and even if case of an upset, it is more likely to be Petra's fault, as her game is always down to all or nothing.